My kids hanging out together before heading off to school. Over the last few days, I have had a couple of conversations with various people - some coworkers, some daycare folks, family, ect, and something has been popping up - this idea of normal parenting as in "Y'all are normal parents." So I've been thinking, what the heck does this mean? Is normal good or bad? These days being normal has almost a nostalgic feeling to it. Like a, "back in the old days when things were normal..." tone. What makes us normal or have normal parenting? Are our children getting a better or worse up bringing if we are being normal parents? The thing is, when people say it, they say it with a tone that has a Wheeew, hand-wiping-the-forehead feel to it. Like being a normal parent is strange or unusual these days. Weird. So, I started analyzing our normal parentingness - cause that is what I do. I over analyze to a fault. Eh, that is just the way it is. - Our kids play outside often. We encourage it and, actually, expect it. 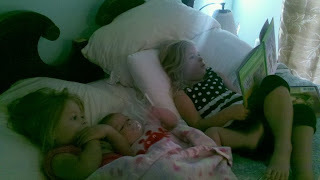 - Our kids watch cartoons like Spiderman, not just learning cartoons. - Our kids have to eat what we cook. Occasionally, we ask what they would like, but if they don't want what we made - tough. No dinner for You. - Our kids are discliplined. That doesn't mean they don't misbehave, cause, Ugh, they do. But they get a combo of all the various punishments - timeouts (used like they are intended - a timeout to get your self under control), vinegar in the mouth (don't call the cops, vinegar is actually Good for you), spankings, jerk ups, fussing ats, all followed with conversations about decision making, hugs, kisses, and apologies. - Our kids have to say mam and sir. Period. - Our kids are expected to go with the flow. Our life did not begin when they were born, and it doesn't revolve around them now. Are they the best things in our life? Yes! Do we want them growing up thinking they are the Center of the universe? Hell no. - Our kids are expected to do for themselves and help out. Take your plate to the sink. Feed the dog. Put your shoes up. Clean up your toys. Two year olds can do all of this. - Our kids are expected to be a part of a family. We are a team, and we love and look out for each other. Always. - Our kids are expected to share and not freak out when things don't go their way. - We do not believe they are more special than other children. We do not expect them to be treated that way. - We expect them to learn about everything. - We expect them to be creative and learn to play with dirt and a stick if that is all they have. - We watch movies in the car on trips longer than 30 minutes. We talk on the way to school and on the way home. - We honor that each child is different, and do not expect them to be carbon copies of each other. - We expect them to be satisfied playing in a large group, small group, or alone. All of these are important to get along in life. - We expect them to talk to us when things aren't right or when they can't work out a problem for themselves. -They go to bed when we decide it is time. They wake up when we decide it is time. There isn't too much of that getting up a million times like on Nanny 911. - We say things like, "That is not for you to worry about. Just worry about being a kid." - We don't always give them choices. They have to learn that they wont always get to choose. Sometimes you just have to drink out of the yellow cup. Sometimes you get to chose which cup. They have to deal with both situations. - We expect them to believe what we say - to trust us, no matter what. We say, "Trust me" if they question what we say. - Sometimes we explain our reasoning; somtimes "because I said so" is the response. It depends. - We foster feeling at ease and comfortable in any situation. We don't do "freak out when Mommy or Daddy leaves". As a result, they Don't freak out. We say, we'll be back later. They say, okay. Done. - We believe that grandparents are essential to a child's upbringing. Grams, Nana, Papa, Grandma, and Pop Pop give them what we never can. And we would never deny them access to each other. -We read every single night cuddled up on their beds with a book they love. - We hardly ever play video games. - We eat together at the table. Rarely do we eat in front of the TV. - We make up songs about each child. The whole family knows and sings them. - We give honest answers. We never lie to them. Exceptions: Various holidays that include various fictional figures. - We encourage imagination and silliness. - We let them run around naked and act crazy in the house at least once a day. - Our kids are not allowed to jump on the furniture. - Our kids take vitamins and drink one glass of milk and juice. Other than that, they drink water. - Our kids are only allowed to have a soda at restaurants and at the Lake. - We do not run to the doctor every time one of them has a red bump, scratches their ear, throws up, or has a slight temperature. We look for non-pharmacutical remedies whenever possible. None of our children have ever been on anitbiotics. Nor have we ever been to the emergency room or had an ear infection - yet. We give vaccinations only because we have to, and they only get the ones mandated for day care. If I had a real choice none of them would get any until they are five. I have many reasons. Too many to mention here - another post, maybe. - We pay attention to our instincts. God gave these children to us, not to doctors, teachers, or other members of our family. We make the call based on what we know of our kids and our ethics. So there it is, basically. Our normal parenting. Is is so different?